Details for Celebrity Xpedition can be found below. Only Celebrity Xpedition® offers the perfect combination of explorer's voyage and cosmopolitan bliss. Travel to one of the last uninhabited places on earth – the legendary Galapagos Islands. Where untamed wildlife outnumbers the pampered travelers. Make moonlight toasts under the stars that led sailors and scientists alike to this extraordinary archipelago. Designed not just for travel, but for exploration, this 96-guest mega-yacht sails to the Galapagos Islands, one of the world's last pristine environments, seven days a week, 365 days a year. Our knowledgeable crew, environmentally sound ship design, and Galapagos National Park-certified onboard naturalists all help to preserve this delicate archipelago, while enlightening you to its natural and evolutionary significance. It's a journey like no other. Amenities: Complimentary sparkling wine, Daily fruit basket and Daily hors d'oeuvres. Complimentary beach towel service and Duvet and pillow-top mattress. Complimentary use of premium bathrobes and Hair dryer. Quality binoculars for use and available for purchase. Complimentary use of snorkel equipment and wetsuits. (460 sq. ft., veranda 195 sq, ft./side veranda 40 sq. ft.) Living room with sitting area including a sofa bed, table and chairs, private bathroom, floor to cealing sliding glass door, private veranda patio with Jacuzzi and lounge chairs. Separate bedroom with two convertible lower beds, dresser and chair, private bathroom and private veranda with floor to ceiling door. Leather key holder, dual voltage 110/220 AC, plentiful storage space in your bathroom and wardrobe, flat screen TVs with DVD players, direct-dial telephone, individual safe, desk, thermostat-controlled air conditioning, private refrigerator and mp3 docking station. Suite Features: (175 sq. ft., veranda 45 sq. ft.). Double bed (cannot be separated or moved), floor-to-ceiling sliding glass doors with veranda, and sitting area. Leather key holder, dual voltage 110/220 AC, plentiful storage space in your bathroom and wardrobe, flat screen TVs with DVD players, direct-dial telephone, individual safe, desk, thermostat-controlled air conditioning, private refrigerator and mp3 docking station. Amenities: Complimentary sparkling wine, daily fruit basket and daily hors d'oeuvres. Complimentary beach towel service, duvet and pillow-top mattress. Complimentary use of premium bathrobe. Hair dryer, quality binoculars for use and available for purchase, complimentary use of snorkel equipment and wetsuits. 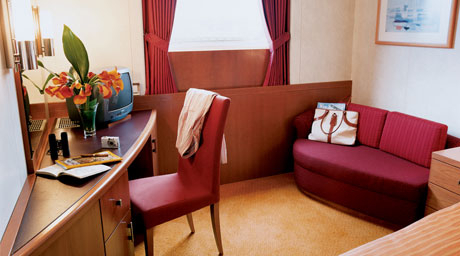 Suite Features (250 sq. ft. and veranda 195 sq. ft.) Two convertible lower beds, floor to ceiling sliding glass doors with a front veranda patio. Sitting area, leather key holder, dual voltage 110/220 AC, plentiful storage space in your bathroom and wardrobe, flat screen TVs with DVD players, direct-dial telephone, individual safe, desk, thermostat-controlled air conditioning, private refrigerator and mp3 docking station. Suite Features: (205 sq. ft. and veranda 50 sq. ft.). Private veranda, leather key holder, two lower beds convertible to queen (except as noted), dual voltage 110/220 AC, plentiful storage space in your bathroom and wardrobe, flat screen TVs with DVD players, direct-dial telephone, individual safe, desk, thermostat-controlled air conditioning, private refrigerator and mp3 docking station. write a review of Celebrity Xpedition.